Here are the best Aruba all inclusive resorts in 2019 selected specifically for you. White sandy beaches, fun and adventurous activities for the entire family and a never-ending relaxation with food and drinks by the poolside, spas and the ocean. 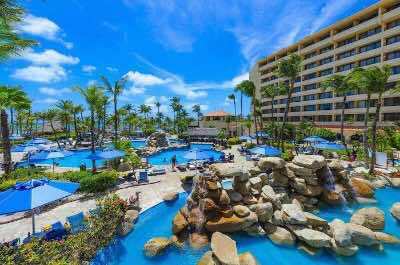 The Renaissance Aruba Resort and Casino is a perfect Aruba all inclusive resort, with private island nearby, reachable by a water taxi. If you heard about Flamingo beach in Aruba, it belongs to the Renaissance! It's family-friendly at Oceanside Suites and adult-only within the Marina Hotel. 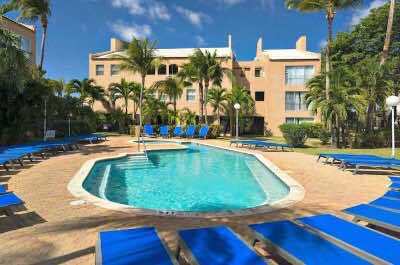 The property is situated close to downtown Oranjestad just off the Caribbean Sea overlooking a marina. There is a free water taxi service that transport guests to enjoy Renaissance Island which offers a family-friendly and adult-only segment on this 40-acre private island. These beaches are the only private beaches on Aruba. There are abundant amenities on the island for patrons from tennis to water sports to food and beverages. There are four restaurants onsite that offer something for everyone’s taste buds. Nightlife includes two casinos and three lounges that offer a variety of nightly entertainment. There are two swimming pools with swim-up bars and one Infinity pool. There is an onsite spa and a spa on the Renaissance Island. The kids club has organized activities. Rooms: There are 556 rooms within Renaissance Aruba all inclusive resort. Oceanside Suites consists of 259 one-bedroom suites that contain an efficiency kitchen, private balcony or patio and views of the pool, island, gardens and ocean. The exclusive adult-only Marina Hotel section has 297 rooms with a private French balcony and views of the atrium/marina, city and ocean. Restaurants: Dining options at Renaissance range from poolside to casual to upscale. Breakfast is served at the Captain’s Corner; Papagayo Bar and Grill serves up light fare, snacks and beverages on the Private Island; Aquarius features a la carte and buffet-style Caribbean seafood cuisine; upscale L.G. Smith’s Steak and Chop House grills up perfect slabs of meat and adult-only patrons can visit Lounge Midnight Grill for late night snacks and beverages. Beach: Renaissance Island is a 40-acre paradise that contains the only private beaches in Aruba. The island is open daily from 7:00 A.M. to 7:00 P.M. The complex offers free water taxi rides for guests every fifteen minutes from the Marina Hotel lobby and the docking area at Oceanside Suites. There are two beaches located on the Private Island which are the family-friendly Iguana Beach and the adult-only Flamingo Beach. The island also sports the Papagayo Bar and Grill, tennis courts, fitness center and a plethora of water activities. Spa Cove is located on the island which provides numerous relaxing treatments. Beach Activities: Beach activities are limited to Renaissance Island where patrons have a variety of beach games such as soccer, volleyball and other organized games. 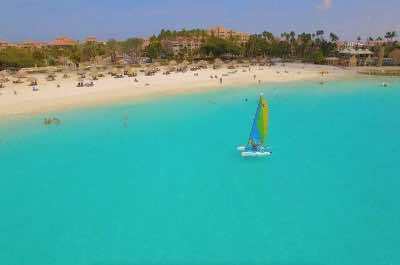 At Renaissance Aruba all inclusive resort patrons can also rent non-motorized and motorized water sport equipment. Guests can also relax while sunning themselves in a peaceful setting that is perfect. Entertainment: A variety of nightly entertainment at Renaissance can be found with DJ’s on selected nights at the Marina Hotel pool, Blue as well as at Lounge Midnight Grill. The resort also features live bands playing Caribbean, Jazz and Rock music on various evenings for guests to enjoy. The complex has two casinos with open 24-hours a day. Kids Activities: Renaissance Aruba all inclusive resort has a Kids Club with supervised activities and games. Babysitting is available for an additional fee. Attractions: Renaissance Island; Renaissance Shopping Mall; Two Casinos; Downtown Oranjestad; Local market; Shopping mall attached to property; Aruba Aloe Museum and Factory; Archaeological Museum of Aruba; Fort Zoutman and Willaim III Tower; Okeanos Spa and Spa Cove. Pools: There are three freshwater pools on the property. Oceanside Suites has two swimming pools with swim-up bars and Marina Hotel has an Infinity pool. All three are situated in a lush garden setting with lounge chairs and umbrellas available. Poolside dining and beverages can be found at Sole. Divi Aruba all inclusive resort is a family-friendly resort which is situated on one-mile of white sand at Druif Beach. This three-story beach resort has plenty of great accommodation options like beach front suites as well as villas for singles, couples and families. All inclusive features include incredible a la carte and buffet cuisine and there is an assortment of bars serving your favorite beverages. Divi Aruba Beach Resort activities include non-motorized water sports, exotic fresh water pools, tennis courts, fitness center, a 9-hole golf course and a kids club. Guests can also enjoy the many amenities at the resort’s sister property, Tamarijn Aruba, which is located within an easy walking distance. Rooms: Divi Aruba all inclusive resort has 203 rooms with views that include Beachside, Garden, Beach and Ocean. There are Golf Villas and Oceanfront Suites available which offer more living space. Restaurants: The main buffet restaurant in this resort is a Pelican Terrace which serves breakfast, lunch and themed dinners. There are also a la carte options with Mexican dishes at Pure Lime; Coco Grill and Bar serves up light fare; the Sandpiper Bar serves up typical poolside food at the beach and enjoy stunning service as well as Italian cuisine at the Red Parrot. Additional surcharge per person options include Windows On Aruba which has a view of the golf course and Fusion Tapas, Steak, Wine and Piano Bar. Guests can also indulge in the food and drink at the sister Aruba all inclusive resort, Tamarijn Beach Resort which includes seven options ranging from Asian to Caribbean to Italian. Beach: The one mile beach front area is complete with incredibly soft white sand, plenty of lounge chairs and there are a number of thatch roofed palapas scattered on the beach which offer comfort from the sun and a relaxing atmosphere. Beach goers can indulge in food and beverages at the Sandpiper Bar. Beach Activities: There is a variety of beach activities at Divi Aruba Beach Resort that are featured and they include snorkeling, kayaks, floats, windsurfing boards, catamarans and an added bonus of a 30 foot beachside climbing wall for guests of all ages to enjoy. Guests can also participate in beach-style Olympic Games, learn the local language, beach volleyball and patrons can even ride a bike along the beach path. Entertainment: There are plenty of interesting nightly activities at Divi Aruba all inclusive resort which will satisfy couples and everyone in the family. Guests can watch a Mystic Show complete with fire dancers; Choreographed synchronized swimming performances. The resort has other themed options such as a Mexican evening with Mariachi bands, Carnival is recreated with fabulous hand-made costumes, Jazz night with talented jazz musicians, listen to Cuban music and view the spectacular dance troupe and there is always a steel drum band that will make your body dance. Kids Activities: There is a Kids Club with supervised games and activities. Attractions: The Links at Divi Village and Golf Resort; Butterfly Farm; Downtown Oranjestad; Indulgence by the Sea Day Spa; Tennis courts; Alhambra Casino. Pools: There are three outdoor pools in Divi Aruba all inclusive resort, which are surrounded by lush greenery and offer plenty of fun everyone. Each pool area has a variety of thatch roofed palapas, lounge chairs and day beds for guests to enjoy. Riu Palace Aruba is a family-friendly Aruba all inclusive resort that combines plenty of fun and relaxation for your vacation. Formerly a Westin property this high-rise resort received a makeover that was completed in summer 2015. Situated within steps from the Caribbean Sea and Palm Beach, this complex offers lush gardens, two swimming pools, a children’s pool as well as lots of entertaining daytime activities. There are five restaurants onsite including a buffet, a la carte choices and poolside dining options. There are entertainment options in the evening that include a casino as well as nightly shows that include music, dancing and singing. The resort has a spa, gymnasium and steam room. There is a Kids Club that offers supervised activities. 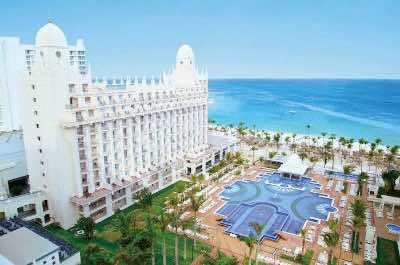 Patrons over the age of 18 years old may also use facilities located at Riu Palace Antillas. Rooms: The 450 rooms, junior suites and suites were refurbished in 2015. Restaurants: Don Nicolas is the main buffet restaurant at Riu Palace Aruba all inclusive resort that is open for breakfast, lunch and has themed dinners in the evening. There are a la carte choices with Sayuri which features Japanese cuisine; Milano serves up Italian; Krystal has innovative fusion dishes and Nautilus serves poolside food by day and is transformed into a steakhouse in the evening. For dessert try the Capucino Patisserie and Ice Cream Parlor. Beach: Palm Beach is just steps away from the Riu Palace Aruba all inclusive resort. This public beach looks out to the blue waters of the Caribbean Sea, has beautiful white sand, many palm trees and thatched roofed palapas that are available on a first come first serve basis. Beach Activities: Beach activities include volleyball, soccer and non-motorized water sports equipment are available for snorkeling, kayaking and standup paddleboarding. Entertainment: During the daytime hours there are plenty of activities by the pool that has dance lessons, zumba classes, bingo and more. This resort offers nightly entertainment that ranges from comedy to dancing to singing to a combination of all three. There are five bars located on the property with the Sports Bar open 24-hours every day. There is a casino on property and guests can visit the Pacha Discothèque located at their sister resort Riu Palace Antillas. Kids Activities: There is a Kids Club for children 4 to 12 years of age that includes supervised activities. Attractions: The Butterfly Farm; Bubali Bird Sanctuary; Fort Zoutman Museum are a short distance from the complex. Pools: There are two fresh-water swimming pools at Riu Palace Aruba all inclusive resort with one having an attached whirlpool and swim-up bar. The second is a children’s pool. There is also a sun terrace at the Riu Palace Aruba all inclusive resort. Lounge chairs and parasols are available on a first come first serve basis. Food and drinks are available poolside at Nautilus Grill. Guests over the age of 18 years old can enjoy the pool at Riu Palace Antillas. The Occidental Grand Aruba all inclusive resorts is a fun filled complex that is ideal for couples and is family-friendly. Located in the Palm Beach area this property is just a walk from your room to the soft white sand beach. There are plenty of places to lounge on the beach, whether in a lounge chair or under an umbrella. The resort has lush gardens, a beautiful pool and seven restaurants as well as six bars for you to enjoy during your stay. Each room has a balcony that offers various views and guests can upgrade to the Royal Club for added amenities, services and living space. There is a variety of non-motorized water sport activities, a full gymnasium and lighted tennis courts as well as a variety of daily beach activities. There is a nice Kids Club on the premises that will keep your mind at ease with lots of supervised activities for your children to enjoy. Patrons can also enjoy a variety of excursions and tours as well as shopping within a short distance of the resort. 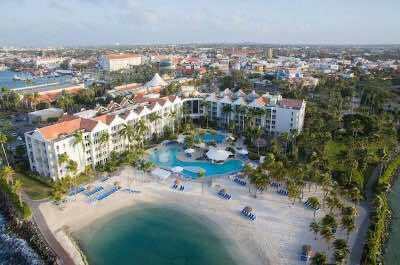 Rooms: There are 368 rooms and suites located within this 9-story beachside Aruba all inclusive resort. Each room offers a balcony and ranges in size from 410 to 484 square feet with a variety of views like garden, pool as well as the ocean. Suites in Occidental Grand Aruba all inclusive resort have 585 to 2,100 square feet of space in a variety of floorplans and upgraded views like ocean front. Royal Club guests will receive upgraded accommodations, amenities and concierge services. Restaurants: There is a variety of cuisine and restaurants in Occidental Grand with The Palm being a buffet-style establishment that serves breakfast, lunch and themed dinners. The service and innovative a la carte cuisine at the Royal Club Restaurant is superb. Other a la carte choices include fresh Italian dishes at L’Olio; Pan-Asian cuisine is available at Zen; El Olvido serves up Tex-Mex; there is Caribbean fusion food at Desire and patrons can enjoy the Beach Club Restaurant at Club de Playa while sunning on the sands. Beach: Occidental Grand Aruba all inclusive resort has plenty of beach front just minutes from your room or suite. The white sand in the Palm Beach area is soft to the feet and there are plenty of relaxing options from lounge chairs to umbrellas to palapas. There is also the Beach Club Restaurant at Club de Playa that offers food and drink for guests as well as the Bikini Beach Bar. Beach Activities: There are plenty of scheduled events on the beach like volleyball, soccer, salsa dance lessons, aerobics and other games for guests to enjoy. Kayaking, snorkeling and equipment for other non-motorized water sports are available for use in this Aruba all inclusive resort. There are also other additional free activities such as jet and water skiing as well as parasailing available by vendors. Entertainment: There are several options for entertainment at this Aruba all inclusive resort. The property has six different bars and lounges that offer everything from a relaxing moment at the Desire Lounge to an energized evening of dancing at the Sound Lounge. Other nightly entertainment shows take place in the Ballroom with the highly entertaining Circaribe Show that runs every Tuesday and the Aruban Night features Carnival themed dancers with colorful costumes on the beach. The complex has a casino with all your usual gaming options. Kids Activities: Parents can relax with some personal time in Occidental Grand Aruba all inclusive resort while the children attend the Kids Club which has various supervised activities for kids ages 4 to 12. The property also has babysitting services for an additional fee. Attractions: There are lots of attractions near this resort like the Arikok National Park, Bubali Bird Sanctuary, the Butterfly Farm, scuba diving, deep sea fishing and an 18-hole golf course is within a ten minute taxi ride. There are also two lighted tennis courts on this Aruba all inclusive resort, with private lessons available. Pools: There is one pool with two attached whirlpools that has plenty of lounge chairs, daybeds and umbrellas. Patrons can indulge in beverages while being by the poolside at the Splash Bar. Riu Palace Antillas is an adults- only Aruba all inclusive resort situated on Palm Beach. This 20-story complex is perfect for couples and singles that are looking for an adult only atmosphere. Just minutes from your bed there is plenty of white sandy area along Palm Beach for relaxation and fun in the sun. Beach activities include standup paddleboarding, soccer, kayaking and more. Each room and suite is comfortable with a balcony or terrace for added space. The complex has a main buffet and four a la carte restaurants that serve innovative cuisine from around the world. There are two swimming pools with a swim-up bar as well as poolside food and beverages. The property has six bars with Lounge 24, that is open 24-hours a day for snacks and beverages. Nightly entertainment includes Pacha Discothèque, a variety of shows within the ballroom and there is a casino. Rooms: All 482 rooms, junior suites and suites have a balcony or terrace as well as a mini-fridge full of beverages. Restaurants: Atlantis is the main buffet that offers breakfast, lunch and themed dinners seven days a week. 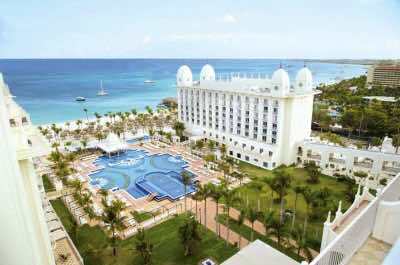 The four a la carte restaurants in Riu Palace Antillas Aruba all inclusive resort include Krystal which prepares Asian fusion dishes; Rimini offers Italian; Malmok Steakhouse serves up big beef near the pool and Palm Beach specializes in Mexican cuisine. Lounge 24 offers snacks 24-hours a day. Guests may indulge in the cuisine that is offered at Riu Palace Aruba all inclusive resort. Beach: Palm Beach has stunning soft white sands and plenty of palm trees. There are lounge chairs, umbrellas and palapas available for guests at this Aruba all inclusive resort. Beach Activities: Activities in Riu Palace Antillas include non-motorized water sports such as kayaking, snorkeling and standup paddleboarding. Other recreational sports on the beach include volleyball, soccer and dance lessons as well as various adult oriented games. There is also a gymnasium and steam room. Entertainment: There are nightly shows that include comedy, dancing and singing in the showroom. There is Pacha Discothèque which is open six nights a week. There are also six bars in Riu Palace Antillas Aruba all inclusive resort where alcohol is served. For example, Lounge 24 is open 24-hours a day. There is a casino with a small race and sports book. Patrons have access to beverages and entertainment at Riu Palace Aruba. Kids Activities: Riu Palace Antillas is an Adult only property. No one under the age of 18 is permitted on the complex. Attractions: There are a variety of water activities for an additional fee which include jet skiing, water skiing, parasailing and scuba diving. Golf is available at Tierra del Sol and The Links at Divi Aruba. There are several tours in Riu Palace Antillas Aruba all inclusive resort which feature archaeological, bio diversity, cultural and historic aspects of the island for additional fees. Pools:There are two pools with plenty of day lounges and umbrellas in this Aruba all inclusive resort. There is poolside food available during the day at Malmok Steakhouse and Palm Beach. Aqua Bar provides poolside and swim-up beverage service. Tamarijn Aruba all inclusive resort is a family-friendly atmosphere with beach front accommodations. 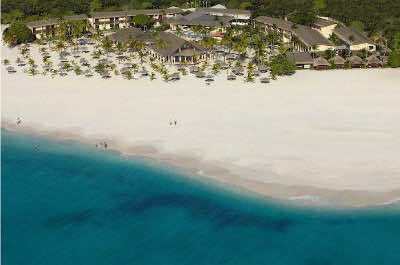 Located on Druif Beach this complex offers more solitude than other resorts located in areas like Palm Beach. The property offers a variety of cuisine options from buffet-style to four a la carte choices. There are three fresh water swimming pools with poolside food and drink options. There are seven bars located throughout the resort for relaxing or fun festivities with friends and family. During the day there are several organized activities for adults to enjoy and the evening brings different family-oriented entertainment to the stage. There is a Kids Club for children 5 to 12 years of age, children’s pool, and babysitting services are available. Guests can also enjoy the many different amenities at Divi Aruba all inclusive resort which is separated by a five minute walk on the beach or patrons can use the properties transportation system to and from each resort. Rooms: There are 236 rooms that have a balcony or terrace with an oceanfront location in low-rise buildings. Restaurants: There are five restaurants onsite in Tamarijn Aruba all inclusive resort with Cunucu Terrace offering buffet dining for breakfast, lunch and dinner. A la carte choices include Paparazzi for Italian; Ginger New Asian Flavours features innovative fusion food; Palm Grill serves hibachi meals cooked on your own in-table hibachi grill and Pizza Per Tutti has poolside wood-oven pizza. Windows On Aruba and Fusion Wine and Piano Bar are available for additional fees. Patrons can also indulge at the five eateries located at Divi Aruba all inclusive resort. Beach: Druif Beach in Tamarjin is a one mile stretch of white powdery sand with palm trees and palapas. Beach Activities: Non-motorized water sports equipment for kayaking, windsurfing, snorkeling and a 30-feet climbing wall. Daytime activities include volleyball, dance lessons, bingo and an assortment of other organized activities. Bicycles are available for families in the Tamarijn Aruba all inclusive resort. Entertainment: Tamarjin offers daily entertainment that includes dance lessons, water games, bingo and a variety of organized activities. Evening activities include nightly thematic shows such as Salsa dancing, Aruban Dance Circus and Mystic Carnival. There are numerous bars onsite and the Alhambra Casino is nearby. Kids Activities: There is a Kids Club in the Tamarijn Aruba all inclusive resort that is open to children 5 to 12 years of age. Babysitting services are available for an additional fee. Attractions: The Butterfly Farm is close; Bubali Bird Sanctuary; Links at Divi Village and Golf Resort; Alhambra Casino are nearby. Pools: Three fresh water swimming pools including a separate children’s pool. There is lounge chairs and umbrellas available on a first come first serve basis. Coconuts Bar in Tamarijn Aruba All Inclusive resort serves up beverages poolside with Pizza Per Tutti featuring poolside food and drinks. Holiday Inn Aruba is an ideal choice for an Aruba all inclusive resort. Holiday Inn Aruba all inclusive resort is located on Palm Beach which is the largest stretch of uninterrupted sand on the island. There is plenty of activity to be found on the beach such as water skiing or kayaking as well as plenty of area for relaxation. The resort boasts three areas of attitude which serve as areas of activity. Guests can choose whether they want to relax with yoga, play volleyball or chill at the spa. There are three bars on the property including a swim-up. There are five restaurants onsite serving everything from breakfast buffets to a la carte choices of innovative cuisine. Rooms: There are 590 rooms and seven junior suites which are situated in mid-rise buildings. Rooms were renovated in 2013 and are available in garden/resort, partial-ocean and ocean front views. Restaurants: There are five restaurants in Holiday Inn Aruba all inclusive resort that include Corals Restaurant for breakfast buffet and a la carte menu service; Da Vinci Ristorante features classic Italian; Pizza Now has brick oven flatbreads too; Sea Breeze serves up seafood and chops; Oceanside Bar and Grill boasts burgers poolside. Restaurants are open to all inclusive and pay as you go patrons. For the people who like to adventure there are several restaurants within a short taxi ride. Beach: Palm Beach has nice white sand with lots of foot traffic. There are several palm trees and the resort offers plenty of palapas for guests based on their status with Holiday Inn rewards program. The higher the status the better the palapa you can reserve. Beach Activities: Situated on busy Palm Beach, Holiday Inn Aruba all inclusive resort has a variety of activities from jet or water skiing to standup paddleboarding to snorkeling available from vendors. There are also organized and impromptu games of soccer and volleyball. Entertainment: The resort has a family activity center which features games, arts and crafts as well as a small arcade. The pool area hosts a variety of activities throughout the day. Several of restaurants and lounges feature live music and dancers at night. There is a cocktail lounge and two other bars on the property. Holiday Inn Aruba all inclusive resorthas a casino. Kids Activities: Holiday Inn has a children activity center which features supervised games and functions. Babysitting services are also available for an additional fee. Attractions: Etnika Spa; Tierra del Sol Golf Course; The Butterfly Farm; Philip’s Animal Garden; Downtown Oranjestad; Onsite shopping mall. Pools: Three freshwater swimming pools with attached jacuzzi’s are situated next to the beach. Oceanside Bar and Grill offers poolside food and drink. Lounge chairs and umbrellas are available on a first come first serve basis. 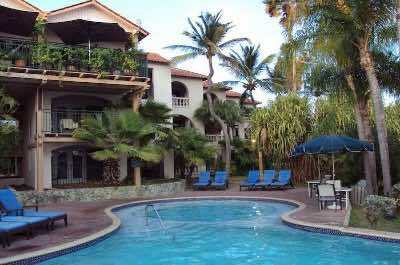 Manchebo Beach Resort and Spa is a quiet Aruba all inclusive resort that is better for adults. This low-rise complex is ideal for scuba divers, couples and honeymooners that want to spend time in a relaxing atmosphere. Located on a wide strip of white sand on Eagle Beach, the resort has plenty of palapas for guests that wish to spend their time playing in the warm Caribbean Sea. The complex has three restaurants that include a bistro, steakhouse, sushi bar and beachside dining as well as in-room dining. Guests can enjoy relaxing yoga and pilate classes on the beach throughout the day. Entertainment includes nightly live music and a relaxing piano bar. The property has a wellness center that includes a spa and fitness center. Children are allowed on the property but there are no daily activities nor is there a kids club or babysitting services available. Rooms: Manchebo Beach Aruba all inclusive resort has 72 rooms situated in low-rise buildings along the beach. Rooms have a variety of views from garden to ocean to ocean front. Each room has an efficiency kitchen. Restaurants: There are many food selections available in this Aruba all-inclusive resort. You can visit Omakase for fresh sushi; Ike’s Bistro serves breakfast as well as lunch for innovative poolside food and beverages; French Steakhouse has all of your prime meat and fresh seafood; Pega-Pega Café and Beach Bar features nice beachside favorites from around the globe and enticing beverages. There are numerous restaurants near the complex making this a great Aruba all inclusive resort. Beach: This Aruba all-inclusive resort is located at Eagle Beach which features powdery white sand and plenty of sun. There are over 40 palapas guests can reserve and plenty of palm trees. Eagle Beach is not as crowded as other locations on the island and offers some solitude. Beach Activities: Beach activities include yoga and other non-motorized water sports like swimming as well as snorkeling. The beach is quiet and reserved with very little in-house activity. There are a number of motorized water sport opportunities such as jet skiing available from vendors on the beach. Entertainment: This Aruba all-inclusive resort offers daily activities and limited entertainment in the evening. There is live music on selected nights and the piano bar at French Steakhouse. Guests may venture into downtown Oranjestad for other entertainment possibilities. Kids Activities: Manchebo Beach Aruba all inclusive resort does not have a kids club or babysitting services available. Attractions: Spa del Sol is located onsite; Downtown Oranjestad for shopping and nightlife; Scuba Diving; Bushiri Kart Speedway. Pools: There is one pool without a swim-up bar. The garden area surrounding the pool has lounge chairs and umbrellas available to guests. The pool area does have food and beverages available at Ike’s Bistro. The Divi Dutch Village Beach Resort is a family-friendly and perfect for couples that are looking for Aruba all inclusive resorts. This low-rise complex of three buildings with an associated swimming pool offers only suites that range from mini-studio to two bedrooms. Each has a kitchen and a balcony or terrace. Located minutes from Druif Beach, guests can frolic in the Caribbean Sea or sun on the white sand. There are limited food and drink options onsite. Guests can purchase a la carte at Divi Aruba Phoenix Beach Resort and Divi Village Golf and Resort where there is nine restaurants and seven bars. This Aruba all inclusive resort has many options through their four sister resorts in the Druif Beach area. There is limited entertainment onsite and guests can engage in organized or non-organized activities day and night at the other Divi resorts. This resort offers the Treasures of the Caribbean Kids Club to children that are 5 to 12 years of age. Rooms: Three buildings contain 123 all-suite accommodations with a balcony or terrace and an efficiency or fully equipped kitchen. Floorplans range from mini-studios and studios to one or two bedroom suites. Restaurants: Dining options at Divi Dutch Village Beach Aruba all inclusive resort are limited. The Tiki Tiki Café is onsite and serves quick snacks as well as beverages near the pool. Patrons may also visit the restaurants at Divi Village Golf and Divi Phoenix Aruba Resort where they may purchase a la carte food and drink. There are a variety of nine restaurants and seven bars operated by Divi in the Druif Beach area. There are several restaurants along the bus route or a short taxi ride away from this resort. Beach: Druif Beach has gorgeous views of the Caribbean Sea and soft white sand that is checkered with palm trees and thatch roofed palapas. Beach Activities: There are a number of non-motorized water sport opportunities such as snorkeling, kayaking and swimming. Organized games like soccer and volleyball are played on the beach. Jet and water skiing as well as other water sports like parasailing are available from vendors. Entertainment: This all-suite resort has limited entertainment. Patrons can enjoy entertainment amenities at Divi Aruba Phoenix and Divi Village Golf. Kids Activities: There is the Treasure of the Caribbean Kids Club available for children 5 to 12 years of age. Babysitting and childcare is available for additional fees. Attractions: There is Alhambra Casino; The Links at Divi for golf; Scuba Diving; Deep Sea Fishing. Pools:There are three freshwater swimming pools at Divi Dutch Village Beach Aruba all inclusive resort, complete with an outdoor grill and seating area. The swimming pools are surrounded by low-rise buildings and lush gardens.